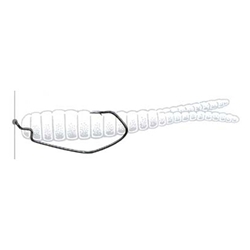 Owner's Down Shot Offset Hook is ideal for the down shot fishing system with its eye in a "down" position which is engineered to ride perfectly horizontal when tied into a line that is to be fished straight up and down. Use a Palomar knot, but pull tag end of line up, over and through the hook's eye one additional time before attaching sinker. You can rig any kind of soft plastic bait and use as a deadly presentation for suspended game fish. These hooks feature light wire, forged shank, and includes a 90 degree shoulder bend, Cutting Point and black chrome finish.